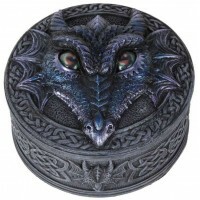 Adorable black baby dragon emerges from his shell in this lovely little box with lift off top. Just emerging from his shell, this black dragon is an adorable addition to your family. Cold cast resin box is 5 inches high with a lift off lid. Perfect for trinkets or jewelry. Item Number: PT-10445 | Approximate Size (Inches): 3.00 wide x 2.50 deep x 5.00 high | Approximate Shipping Weight: 1.00 lbs.